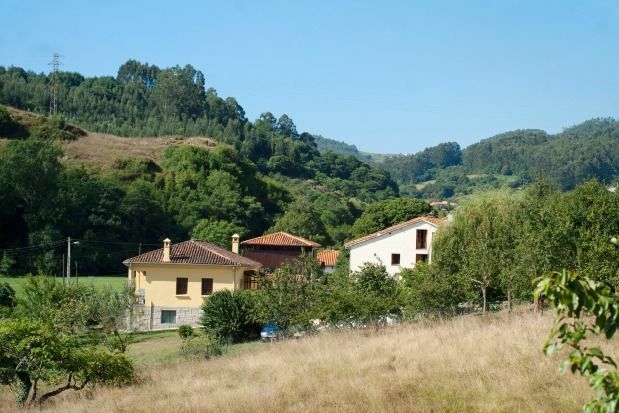 Casa Fabián is located on the central Asturian coast, in the town of Pillarno, 7 minutes from the coast and the mountain, to enjoy unforgettable days in nature, practicing all kinds of outdoor activities. - Ground floor: Kitchen- living room with: sofa bed of 1.20 m, wood stove, television, ceramic hob, washing machine, microwave, figrorífico and kitchenware. Main bathroom. - First floor: A double room with built-in service. Water and central heating. Private parking. Capacity: 2 people. It is located in the town of Pillarno, which has a privileged location to move to any point of Asturias without making large displacements. It belongs to the municipality of Castrillón, also known as "the municipality of the seven beaches", due to its many kilometers of sand and sea: Salinas, Santa María del Mar, San Juan, Berries, Arnao, El Sablón, etc., and six kilometers of the Asturian Central Coast. Nestled in a valley, its vegetation is green and leafy. An ideal place to rest. The furniture and interior decoration has been made in fine woods and wrought iron. It consists of: - Parking on the farm for all the houses - Central heating and hot water in all houses Dogs of all sizes and breeds are admitted, including PPP, with no additional fees.